Why choose between a winter sun break and a skiing holiday? After the culture and sights of San Francisco and the Napa Valley, you’ll spend a week skiing the slopes of Lake Tahoe before heading south to the sun of Las Vegas and LA. A great road trip, best taken in March. Great skiing and a great tan all in one trip! Collect your rental car and head through the historic streets of San Francisco and over the Golden Gate Bridge. The Bridge links the headlands of San Francisco and Marin County and is one of the world's most beautiful bridges. You'll then spend your first night in a lovely Marin County town like Sausalito or Tiburon. A packed day of scenic driving today. Cruise through the Valleys of Napa and Sonoma, taking in the beautiful views of vineyards on rolling hills. Alternatively spend the day in Sacramento on the way to Lake Tahoe, stop by and admire some of the State Capital's buildings and sights. Then onto Lake Tahoe. Split in half by the California/Nevada state line and completely surrounded by alpine mountains, this natural wonder is quite a sight to behold. Casinos welcome you to the Nevada portions of the shoreline, whilst classy ski resorts can be found all around. Lake Tahoe boasts 7 major ski resorts here including the Olympic resort of Squaw Valley to the north. Why not start in Alpine Meadows? It features 12 lifts and a surface lift for beginners and children. Alpine Meadows has than 100 runs covering 2,000 acres, kid programs a family ski area and more challenging runs for the more accomplished. Your Road Trip Pack will give you more information on the various skiing options. Perhaps try Northstar today? Consistently rated among the finest ski resorts in the West, Northstar offers 63 runs on 2,400 acres. Excellent, fast lifts with short lines. Activities and facilities for every age and experience level. Northstar is the all-round family fun resort. Heavenly, on Lake Tahoe South, is one of the most visited resorts as it offers 4,800 acres and 27 lifts, not counting the spectacular tram ride to the top. It also offers 82 runs at elevations up to 10,000 feet, the highest of any other resort. Heavenly is a particularly good place for snowboarders too. Heavenly is also best known for the awesome lake views that are seen from the ski slopes. Enjoy the epic drive from Tahoe to Mammoth with an eerie pit stop at the Ghost Town of Bodie. Great for beginners and pros alike, there are 28 lifts that will whisk you away to fantastic views and great trails which will you keep you busy all day. The high runs offer wide open runs whilst the lower ones offer shelter from the trees. With the best annual snowfall of all the US, conditions rarely fall short of perfect. This really is a gem of a place that once you visit you’ll want to go back. You’ll get to max out your mountain time here too as the lift queues are rarely lengthy. It's possible to ski in the morning here before cruising through Death Valley by late afternoon or early evening. This extreme climate and geology form an inhospitable destination that has another world feel to it. The roads here are superb, dipping and leaning around curves before straightening out as you drop to 85 meters below sea level in the salt flats of Badwater. The ultimate apres ski experience will help you unwind and rest those tired ski legs. First class hotels, cuisine and entertainment await as you arrive at this former desert watering hole. 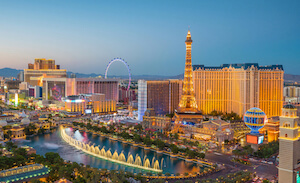 We recommend at least a two-night stay here to really allow you relax but also enjoy the sights and sounds of Las Vegas. 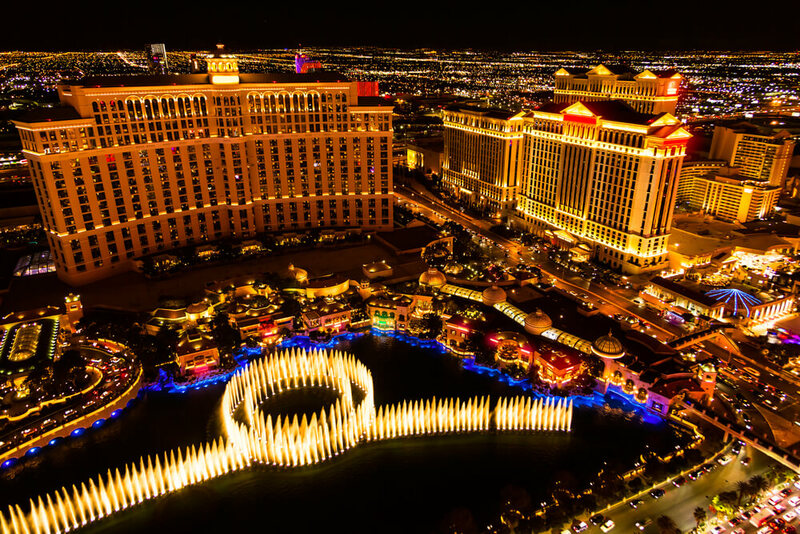 Along the strip there is so much to see and do, the choice is yours. Take in a show or shop till you drop at one of the many shopping malls. In the evening you can sample food from all the world. If you have the energy, you can party all night in the clubs and bars. Need another nature fix? The Valley of Fire State Park is located just outside the city offering red sandstone formations that can be explored by foot or with a tour guide. Enjoy another day relaxing or exploring in Las Vegas. For something a little different, head north to Fremont Street to see the 'Old Vegas'. This is where you'll find the more affordable hotels and casinos offering lower buy-ins. Great if you want to experience gambling at a more affordable rate. Continue towards the coast, arriving in Los Angeles. Tinseltown is synonymous with glitz and glamour, and although many of the studios have now moved onto other parts of the city, it's still fun to visit the home of the Oscars and walk Hollywood Boulevard looking for the handprints of your favourite movie stars. Just a short drive northeast of here is Griffith Observatory, perched high on a hill overlooking the urban sprawl of LA, this landmark is well worth a visit and is great for views of the legendary Hollywood sign. Beverly Hills offers the chance to see movie star homes with sky-high fences on the palm tree lined streets. Close by is the amazing Getty Center, this is a firm favourite of the team at The American Road Trip Company - your personalised Road Trip Pack will tell you more on this and all the other essential places to see in La La Land. Santa Monica in Los Angeles. Santa Monica with its “Baywatch” beaches and old-fashioned Pier is a worthy finishing place for your road trip. Hire a bike and cruise the boardwalk down to Venice Beach or shop your heart out on 3rd Street Promenade. The following day you’ll fly home from LAX after spending the morning finishing off any sightseeing. Don't forget to check out this road trip's Itinerary tab to see more amazing pictures from our California Ski & Sun tour. You'll also be able to read a little bit about what you'll be getting up to on each day of this incredible road trip adventure.